Jeffrey R. Fine works with clients to resolve complex business issues, focusing on insolvency, bankruptcy, receiver and receivership, and creditor workout areas. 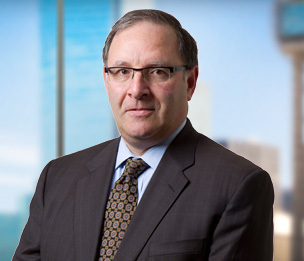 He has wide experience in defense of officer and director fiduciary liability cases, insolvency related litigation matters, and representation of receiverships (federal equity and state). He advises debtors, lenders, creditors and other stakeholders on a wide array of bankruptcy issues ranging from the purchase of assets out of bankruptcy, loan workout, and general business bankruptcy matters. He also appears frequently in energy, healthcare and real estate complex Chapter 11 cases representing creditors, debtors and creditor committees. Mr. Fine combines litigation skills and a wealth of diverse experience in providing practical business advice to represent clients throughout the United States. Mr. Fine formerly served as a member of Dykema's Executive Committee. Mr. Fine has been repeatedly recognized as a "Best Lawyer in Dallas" and a "Super Lawyer" in Texas in the area of Bankruptcy and Restructuring. Mr. Fine has significant experience counseling boards of charitable nonprofit and tax-exempt organizations including private schools and houses of worship. Prior to joining Dykema, Mr. Fine was a partner at an AmLaw 100 firm in Dallas, Texas. Director and Officer (D&O) representation in fiduciary breach and usurpation of corporate opportunity cases. Receiver and trustee representation in federal equity receivership and litigation trust matters. Secured creditor representation in contested complex Chapter 11 matters. Debtor and lender representation in complex secured loan workouts. Defense of complex bankruptcy and insolvency related adversary proceedings and litigation. Lender representation in the workout and bankruptcies of troubled secured real estate and unsecured consumer loan portfolios involving Chapter 7 and 13 filings, out of court loan modifications, and foreclosures. Lender representation in the workout, bankruptcy and/or foreclosure of more than $1 billion in secured commercial real estate loans in multiple jurisdictions. Lead attorney, Unsecured Creditors' Committee in the Texas Rangers Baseball Partners Chapter 11, with 100 percent payout, plus interest to unsecured creditors. Lead counsel for QSR and specialty lender servicers in distressed portfolio workouts, foreclosures and bankruptcies. Lead counsel to consortium of corporations regarding environmental issues in complex environmental services Chapter 11 cases. Lead bankruptcy counsel to large environmental trusts. Lead counsel to liquidating trust asserting complex breach of multiple duties of loyalty of officers and directors of former Chapter 11 debtors. Lead counsel in the successful Chapter 11 reorganization of the second largest vinyl and aluminum window manufacturer in the United States. Lead counsel in the successful Chapter 11 reorganization of a VOIP telecommunications company. Lead counsel in the successful Chapter 11 reorganization of the largest independent bookstore chain in the Southwest. Litigated and successfully settled antitrust claims against more than 18 booksellers, including major publishing houses and a national bookstore chain. Team member in the successful Chapter 11 reorganization of a major cargo and charter passenger airline. Counsel to airports in more than 25 airline bankruptcies. Lead counsel working in conjunction with the United States Department of Transportation on Passenger Facility Charge litigation on behalf of various airports in airline bankruptcy cases nationwide. Nationwide representation of various equipment lessors in complex Chapter 11 cases. Nationwide representation of various truck manufacturers in dealer bankruptcy and workout matters. In the Matter of Hargis (Palmer & Palmer, P.C. v. United States Trustee), 887 F.2d 77 (5th Cir. 1989). Transfers made to prepetition creditors out of nonestate assets may not be avoided. In the Matter of Hargis (Palmer & Palmer, P.C. v. United States Trustee), 895 F.2d 1025 (5th Cir. 1990). Bankruptcy Code Section 329 does not apply to services which were unrelated to bankruptcy proceeding. In re Altman Nursing, Inc. (Clay Capital Corp. v. Gerrit M. Pronske), 299 B.R. 813 (Bankr. N.D.Tex. 2003) Order Affirmed at 306 B.R. 854 (N.D.Tex. 2004). Vacated and Remanded by In re Altman Nursing, Inc. 121 Fed.Appx. 56 (5th Cir. 2005), Contest between claimant and its counsel regarding rights to attorney fees in Chapter 7 case. In re Susan R. Miles (MAXIM Healthcare Services, Inc. v. Susan R. Miles), 2005 WL 1981040 (N.D.Tex.). Finality of bankruptcy court order and jurisdiction to hear appeal in Chapter 13 case. In re Financial Corporation of America, 119 B.R. 728 (Bankr. C.D.Cal. 1990). Scope of Rule 2004 discovery by Chapter 7 trustee of 70,000 boxes of bank records. In re Avado Brands, Inc. (William Kaye v. Thomas E. Dupree), 358 B.R. 868 (Bankr. N.D.Tex. 2006). Analysis of bankruptcy court's subject matter jurisdiction over post-confirmation proceedings. Thomas E. DuPree v. William Kaye, et al., 2008 WL 294532 (N.D.Tex). Analysis of standards to permit an appeal under Section 1292(b). In re DataVoN, Inc., 303 B.R. 119 (Bankr. N.D.Tex. 2003). Analysis of what constitutes "substantial contribution" in a Chapter 11 case. In re Midway Airlines, Inc. (Sheldon L. Solow v. Dallas/Fort Worth International Airport), 1994 WL 197480 (Bankr. N.D. Ill.). Analysis of standard for permitting leave to amend complaint under Rule 7015. In re Coleman Pipe, Inc., 40 B.R. 338 (Bankr. N.D.Tex. 1984). Analysis of extent of creditor's security interest in light of draw on letter of credit. In re The Seasons Apartments, Limited Partnership, 215 B.R. 953 (Bankr. W.D.La. 1997). Analysis of whether claims are unimpaired for plan confirmation purposes. In re Gulf Coast Holdings, Inc. d/b/a Unidynamics, Inc., 2007 WL 1340802 (Bankr. N.D.Tex.). Plan confirmation issues.